In a small frying pan, gently fry the sausages in the oil, turning them frequently until evenly browned. Transfer to a plate and tip the onion into the pan. Add the sugar and cook, stirring frequently, for about 10 minutes until deep golden and beginning to caramelise. Add the cinnamon, stock powder and 100ml cold water then return the sausages to the pan. Cook gently for 10 minutes, until cooked through. 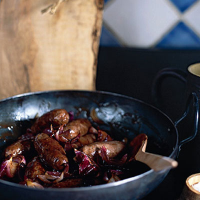 Pile the sausages and onions onto warmed serving plates. Add the balsamic glaze and chocolate to the pan and cook over a very gentle heat until the chocolate has melted and the mixture is glossy. Add 2-3 tbsp cold water if the mixture is too thick, then spoon over the sausages and onions to serve.